In case you missed it, the BITS Webshop (hosted courtesy of Ancient Tomes) is back online, free from eBay’s loss-making constraints! 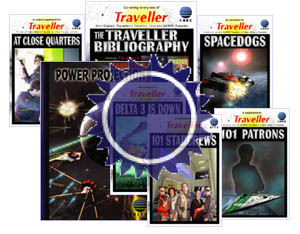 You can order your BITS Traveller products here. eBay cause (temporary) demise of BITS Webshop! Unfortunately, due to the recent significant increases in eBay fees for webshops, we have have been forced to close down with BITS Webshop at Ancient Tomes. This is as we could no longer sell products without making a loss (we have never priced highly compared to other publishers as a deliberate policy) via eBay Shops. We are working on a fix, and should have a new facility up soon. We've had a limited restock of most of our titles, which are suitable for use with Mongoose Traveller, and most other editions. You can find them at our eBay webshop here. We've put all the unsold copies from the initial run of 'Cold Dark Grave' up at our webshop on eBay. If you fancy a Classic Era Traveller adventure, it may be just your cup of tea! This was only a small volume run, so will not be in retail until the second print run is completed, which will be at least a month. If you do happen to buy a copy and like it, please feel free to review it at one of the online RPG sites like RPG.net. Cold Dark Grave is set in Yres, in the Regina subsector, one of the two systems involved in the last battle of the Fourth Frontier War. The characters all work for a belt mining company which is struggling through the post Fifth Frontier War depression. A job offer they can't afford to ignore comes along and events ensure. This is a predominantly space based adventure set in the Classic Era. The scenario has been one of our most popular at cons over the last two years.